Put these delicious chocolate-y Oozing Eyeball Cookies on the Halloween treat table and they may just be gobbled up before anyone even makes the 'eyeball cookies' connection. Shape cookie dough into 18 balls. Bake as directed on package, topping with marshmallows, cut-sides down, for the last 2 min. Immediately top with candy bar halves. Top cookies with Halloween sprinkles just after the chocolate bars have melted. Cooled cookies can be stored in airtight container at room temperature up to 1 week. These small candy bars are available in many different varieties. 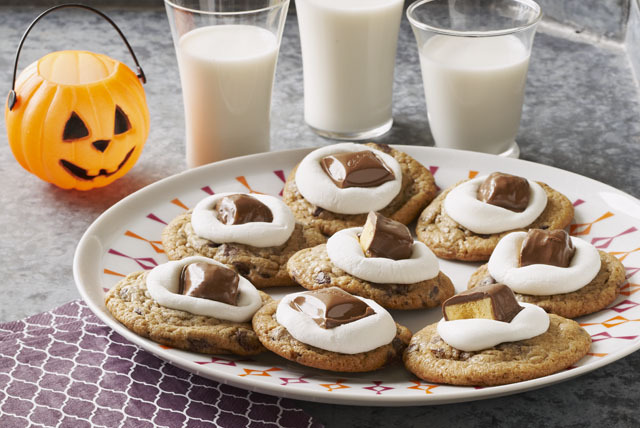 When preparing these fun-to-eat cookies, be creative and use an assortment of bars.